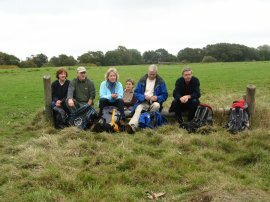 Having finally finished the Saxon Shore Way the next walk for the walking group is the Vanguard Way which runs between Croydon and Newhaven and we walked this, the first stage, on 11th October 2009. 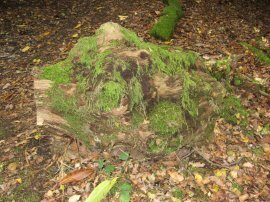 The Vanguard's Rambling Club have created a comprehensive on-line guide to the Vanguard Way, a walk that they originally devised, and their Vanguard Way website is well worth checking out. 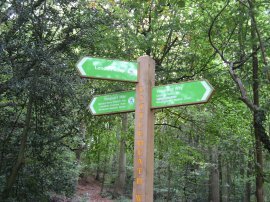 It not only contains step by step guidance along the route but also a wealth of other information on the places the walk passes by. Rather than drive all the way round London I took the train to East Croydon and met up with the rest of the group outside Croydon East station where the walk officially starts. Having taken the obligatory start of walk photo, photo 1, we set off on our way through the streets of Croydon, a far more urban location than we normally walk in. From the station the walk heads through the suburban streets up to Lloyd Park, photo 2, before crossing over the tram lines to briefly join Coombe Road. The route then turns down Conduit Lane and then the unsurfaced Ballards Farm Road before heading through more suburban streets towards Littleheath Woods, photo 3. In the woods the route links up with the route of the London Loop where the ground was covered by large numbers of Chestnuts that had dropped from the trees. A reasonably new signpost for the two paths, photo 4, showed that it was 62 miles to our eventual destination at Newhaven. Leaving the wood the route crosses the A2022 Selsdon Park Road before joining a footpath that runs between the houses of Selsdon towards Selsdon Wood. 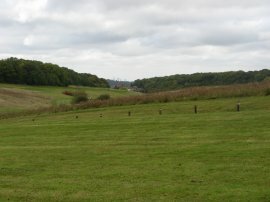 Here the route turns to the right running alongside a golf course towards Puplet Wood. Leaving the trees the path heads along a track that leads up to Farleigh Road where the route of the Vanguard Way parts company with the London Loop. After stopping for a short snack break we once again joined path running alongside the golf course from where there were views from the downs over to the tower blocks of Docklands, photo 5. Reaching Farleigh Court Road the route turns to the left for a short distance before joining a driveway on the right that heads up to the Church of St. Mary the Virgin at Farleigh, photo 6. 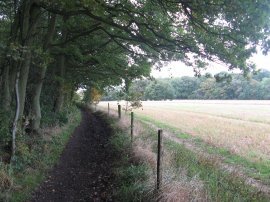 Having headed between a couple of paddocks the route then joins a path the runs along the edge of Great Park Wood, photo 7, before joining a rather uneven track that leads up to the small village of Chelsham. 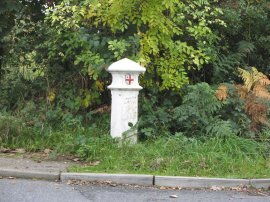 At the junction of Harrow Road and Chelsham there was a coal post situated, photo 8, where Dave and Derek, acting on a hunch, also found a geocache hidden nearby. 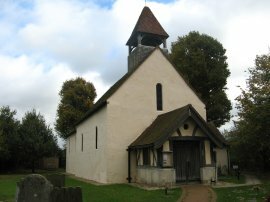 The route then heads along Chelsham Common Road for a short distance before joining a track that runs along the edge of Henley Wood and a large field to reach Ledgers Road. Here the route turns to the right and then right again at the B269 Limpsfield Road. For the first time in many of the group walks we had set off with almost a complete set of walkers, everyone being present except for Anne who was going to join us later. 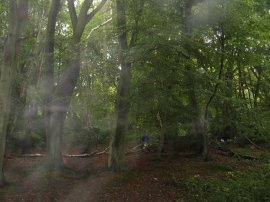 However Maria was walking with her arm in cast and she decided to drop out at this point and continue down the road to Warlingham while the rest of us headed to the left to head through a small patch of woodland at Slines Oak, photo 9. This path soon led out to the open grass fields of Nore Hill, photo 11, where we stopped to have lunch, sitting on a low jump. Having eaten we continued over the top of Nore Hill, photo 12, before heading steeply downhill by Hovings Hole to cross the bottom of a valley by the riding stables of Warren Barn Farm. Reaching Oak Road the route turns to the left along a field edge path before joining another steep grassy track that starts heading uphill on to the North Downs. After the initial section of open path the route joins a tree lined track that continues on uphill. 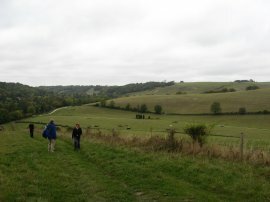 Photo 13 was taken looking back down the way we had come with Nore Hill on the horizon. 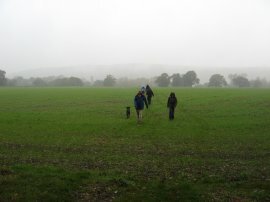 As we were heading uphill we were met by Anne and Zuka who joined us for the remainder of the days walk to Limpsfield Chart. Reaching the top of the downs above Woldingham the route crosses a road and heads down the rather busy Chalkpit Lane for a short distance before joining a footpath that leads to the Oxted Downs National Trust nature reserve. 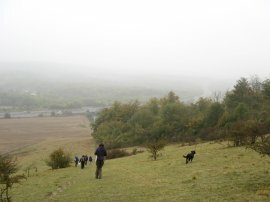 As we had been walking the weather had steadily been deteriorating and the light drizzle that had been falling soon turned to quite heavy rain necessitating a quick stop to put on waterproofs. 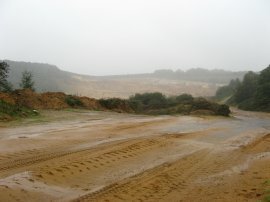 In clear weather there would have been good views across the Surrey countryside from the top of the downs but these rapidly disappeared under the low grey skies as we stared making our way down towards the M25, photo 14. 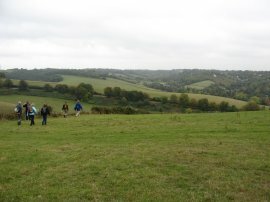 At the foot of the downs we linked up with the route of the North Downs Way which we followed off to the left along a field edge path running below the Titsey Plantation. 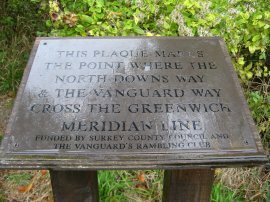 Here the route crosses over the Greenwich Meridian, the site of which is marked by a small plaque, photo 15, although it was some distance passed this point that my GPS read all zeroes. This caused a bit of debate at the time however subsequent research uncovered that with the advent of global positioning technology in the 1990s, a new virtual meridian was introduced. 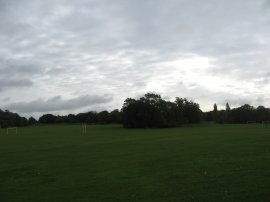 It lies 102½ metres further east than the official Greenwich meridian and is the line used for all air and sea navigation which nicely explains why my GPS did not show 0.000.00.00 until much nearer the field boundary than the marker was. A short distance past the meridian we reached Pitchfont Lane where we parted company with the North Downs Way which follows the sunken lane back up towards the top of the downs while the Vanguard Way heads along the lane to the right towards Pitchfont Farm. 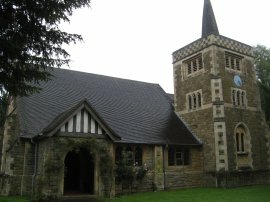 Several years ago my son had wrestling lessons in Selsdon and I had walked the Vanguard Way as far as the lane in a number of short stages while he was in the lessons and having turned right at this point I was finally on new ground. We headed through the busy farmyard before joining a footpath that ran diagonally across a number of fields towards Titsey Road. Photo 16 was taken looking back towards the North Downs from the shelter of the trees at the road edge. Once across the road the path headed over one more field to join a path that ran alongside the edge of the M25. By this stage the ground had become wet enough for the mud to start sticking to our boots, a sure sign of the approach of the winter months! 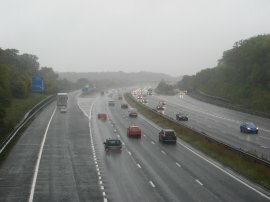 Eventually the route reached a bridge over the M25, close to the entrance to Clackett Lane services, photo 17. 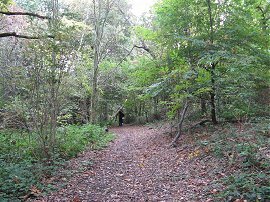 Here the route joins a track that along the edge of Titsey Wood up towards the Moorhouse Sand Pits, photo 18, where the route continues ahead into Brooklands Lane. 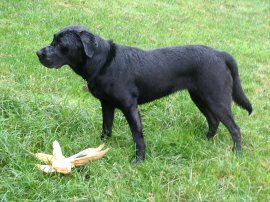 This is followed up to the A25 which the route crosses to join a path running between the gardens of two large house before heading out into fields which had been planted with maize when went by, photo 19. 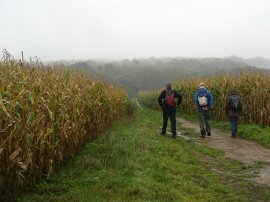 The route then heads downhill to enter Loampit Woods and as we descended Zuka, photo 20, had fun playing with a head of corn. 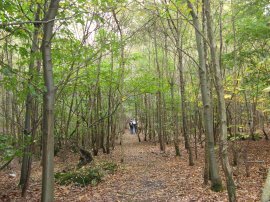 Once in the wood the route starts heading gently uphill again along a path that was at times rather indistinct, photo 21. However despite the indistinct nature of the path the route was well way marked with markers at most crossing paths. In fact the whole of the stage had been fairly well way marked with a lot more signs being in place in the urban areas around Croydon than when I had first walked that part of the route. Leaving the woodland the route crosses Ridlands Lane and heads along a path that runs alongside a cricket pitch situated on a patch of open ground to join Stonleigh Road. This followed up to Moorhouse Road from where it was just a very short distance up to the where the cars were parked, opposite St Andrews Church, photo 22, where we ended this stage of the walk. Reaching the cars we had walked 15.4 miles. 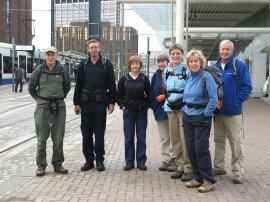 It had been nice to meet up with everyone again and great to be setting out on a new walk. Despite the grey conditions we ended the walk in, by the time we had driven back to East Croydon station the sun was out and at home in Walthamstow, which is not that far away as the crow flies, there had been no rain at all! I however was rather soggy, my waterproof trousers definitely needed a bit of re-proofing, and I felt rather out of place with my damp clothes and muddy boots as I was heading up the Victoria line through central London to home.